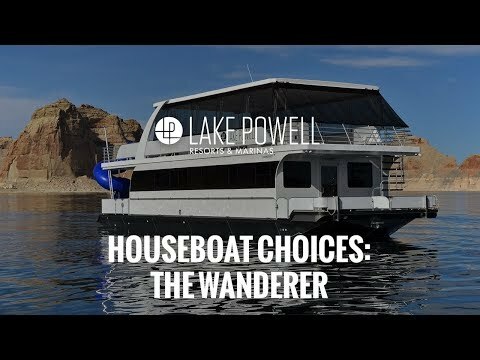 The Wanderer is the newest addition to the Lake Powell fleet, and you will love it! With its monohull design, this 59-foot houseboat is a full two feet wider than our other 59-footers, which translates to lots more room inside. It’s big—the Wanderer features four full-height staterooms with doors and sleeps 12—yet it’s also family-affordable. The Wanderer was custom-designed and built for Lake Powell. So we packed it with all the latest amenities, like a waterpark-style tube slide and a reverse floor plan which provides easier lake access to the living area (and more privacy for the bedrooms) when you’re anchored at your favorite beach. There’s also a screened upper deck with comfy built-in seating, wet bar, barbeque, and loads more. Pets are are not permitted on the 59' Wanderer Houseboat.